Kingfishers are a clearly defined group of birds, usually classified as the family Alcedinidae within the avian order Coraciiformes. They are most often placed in the suborder Alcidines, along with two small groups of birds from Central America, todies (family Todidae) and motmots (family Mo-motidae). Their other near relatives are bee-eaters (family Meropidae), while they appear to be more distantly related to rollers (family Coraciidae), hoopoes (families Upupidae and Phoeniculidae), hornbills (family Bucerotidae), and possibly even trogons (family Trogonidae). The earliest fossil kingfishers are known from deposits that date to the relatively recent Lower Eocene, about 40 million years ago. These deposits in Wyoming are complemented by even more recent deposits from Germany and France, and also by material less than 25 million years old from Australia. This suggests that kingfishers have always been widely distributed across the world, including during the last two million years, when fossils similar to or identical with modern species have also been recorded from Australia, New Caledonia, Israel, Europe, North America, and Brazil. However, kingfishers form part of the radiation of coraciiform perching birds that was already well-established by about 60 mil lion years ago, soon after the end of the Cretaceous era, so even more ancient fossils can be expected. more specialized modes of foraging, such as hawking insects or hovering over fish. Third, that singular species, such as the shovel-billed kookaburra (Clytoceyx rex), are more likely to be ancestral than larger groups of similar species, such as the collared (Halcyon Moris), sacred (Halcyon sancta), and chattering (Halcyon tuta) kingfishers. Halcyon bougainvillei kingfishers, to the genus Actenoides (considered part of Halycon in Peters). The remaining species of this subfamily are not obviously specialized, other than having juveniles with faint barring on the breast. However, because some smaller groupings are evident among them and because there are so many species, they are usually separated into four genera for convenience. Pelargopsis (three species) have large stork-like bills, while Syma (two species, considered part of Halycon in Peters) have serrated edges to their yellow bills. 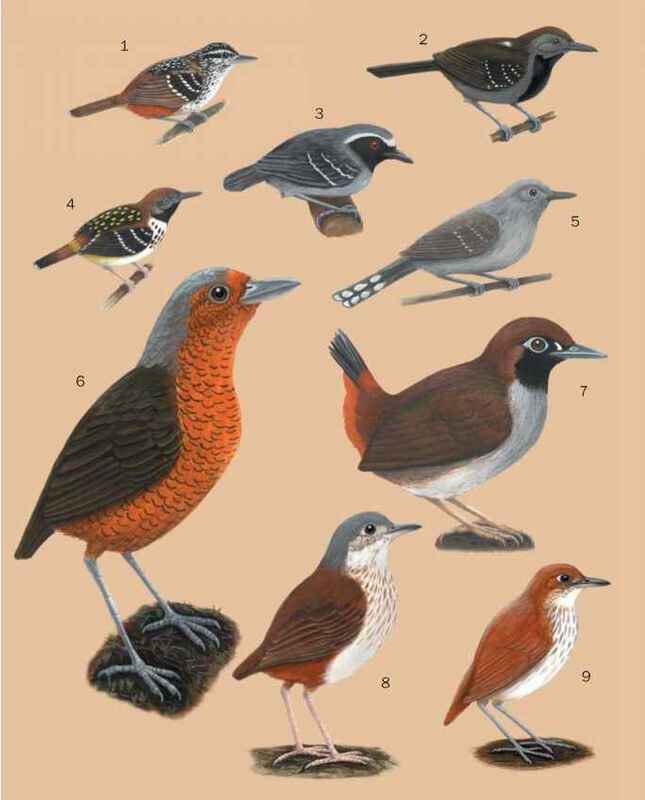 The remainder are all extremely similar but can be divided into Halcyon species of Asia and Africa, and the various forms of blue-green and white Todiramphus (20 species, considered part of Halycon in Peters) of Asia and Australasia with their white collar, dark eye patch and, in some species, blue or reddish breast. The subfamily Alcedininae offers a much simpler arrangement, with only two genera to contain these small, mainly piscivorous kingfishers of Africa and Asia, several of which have the second toe reduced or absent. They include the smallest of the dwarf or pygmy kingfishers of the genus Ceyx (11 species), several with reddish upperparts, all inhabitants of forest and woodland, feeding mainly on small insects, and most with a red, dorsally flattened bill when adult. The remainder are combined in the genus Alcedo (9 species), most of which feed predominately on fish, have blue upperparts and a blue breast band, and a long, black, laterally flattened bill. 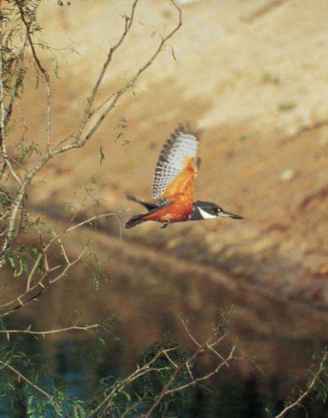 The common kingfisher (Alcedo atthis) of Eurasia is probably the best-known member of this genus. Some African species form a link between these two genera, with blue backs but red bills, which sometimes leads to their separation as a third genus Corythornis in other treatments. The third subfamily, Cerylinae, is the only one with members in the Americas, including all members of the green-backed genus Chloroceryle (four species). All species feed mainly on fish and appear closely related to the smaller alce-dinines. The cerylines include the largest piscivorous species in the genus Megaceryle (four species, considered part of Ceryle in Peters), each with pied-and-reddish plumage and inhabiting one of the continents of the Americas, Africa, or Eurasia. Finally, the pied kingfisher (Ceryle rudis) of Africa and mainland Asia, also with sexually dimorphic bands across the breast, is sometimes placed in its own genus Ceryle but only because of its smaller size and specialized hover-hunting behavior.